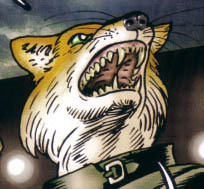 What do you get when you combine furry, steampunk, detective thrillers, alternative history, and a bit of Quentin Tarantino? 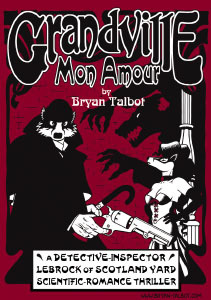 Bryan Talbot's Grandville series of graphic novels; two so far, Grandville (2009) and Grandville Mon Amour (2010). Both are about 100 pages and very sturdy hardcovers. Sounds like quite the hodge-podge of genres, no? Yet it works! Steampunk? Wax cylinders, gears, message tubes, locomotives, automatons and airships. Detective thrillers? A Scotland Yard inspector on a difficult case. Alternative history? Grandville is Paris, and the First French Empire conquered Great Britain 200 years ago. Britain eventually regained independence after a nasty period of revolt and anarchism, but the British Empire never happened; now it's simply one more country dwarfed by the French. Furry? Pretty much everyone in it. Quentin Tarantino? The occasional bit of mature content, lots of high-action fights, and not shy about it. For furry fans, there'll probably be two main factors determining whether you'll like it. First, if you like Tarantino-style action, you'll like this, although it's neither as extreme nor as gratuitous as his work. Secondly, Talbot's character design – it either works for you or it doesn't. I like his coloring and how he uses shadows, and while his backgrounds really capture the feel of steampunk, some characters are drawn with rather harsh features, especially emphasizing the teeth. 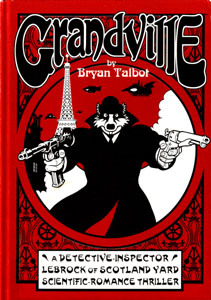 Do an image search for "Grandville" and "Talbot" and you should get a feel for his artstyle. It's extremely anthropomorphic, more so than most furry titles. 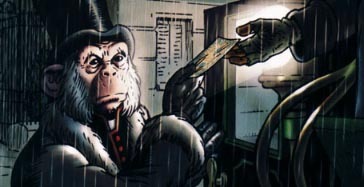 Not content to use the typical slew of animals, Grandville's side-characters include fish, simians, birds, and even the occasional human: "They're a hairless breed of chimpanzee that evolved in the town of Angoulême, near Bordeaux. Never been granted citizens' rights." This is my main quibble with the comic: heavy-handed tributes. For example, a character named Snowy Milou – the name of Tintin's dog in English and French – turns out to be a fox terrier. Surprise, surprise – but do we really need two largely useless pages of obvious references to four Tintin books on top of that? No, we got the point. The trick to heartfelt tributes is being brief and subtle. Even less subtle: the first book details a past terrorist attack against a major building, now referred to as "Ground Zero", and the antagonists' ultimate motivation matches certain theories about what's recently driven U.S. foreign policy. These are major plot points; lifting them out of real life doesn't feel like alternative history, but lazy writing. Don't get me wrong – I really enjoyed the first book, but I wish the bad guys' motives had been anything else. Thankfully the high-action ending prevents this disappointment from spoiling the climax. The second book improves in terms of external references. Its main story arc doesn't parallel real life, and so it feels like more effort was put into it. Two sub-plots are again overly-obvious nods to Jack the Ripper and Sherlock Holmes; though unoriginal, they fit better with the flow of the story. Still a thumbs-up! The main character in the series is Archibald LeBrock, a Detective Inspector for Scotland Yard. A tall, muscled badger, he has a sharp eye, good intuition and strong deductive skills. His major failing is a fierce temper, especially when anyone stands in his way. One gets the feeling his superiors must tire of cleaning up after him, but can't deny that he gets the job done. His partner is Detective Roderick Ratzi, a smart, well-dressed, resourceful rodent who's also very good in a fight. The two officers have a close working rapport. In the first volume, LeBrock and Ratzi investigate the suspicious death of a British diplomat. On the surface, it looks like suicide, but on closer inspection it appears to be murder – leading the pair to the city of Grandville. They track secret agents, discover more suspicious deaths, and encounter an increasing amount of anti-British sentiment. The trail finally leads them into the upper echelons of the French government. 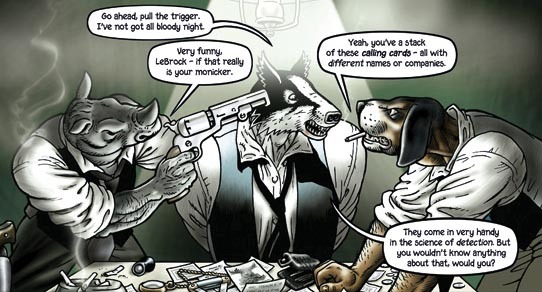 In Grandville Mon Amour (My Love), LeBrock is recovering emotionally from the events of the first volume. Despite resigning from the Yard in a moment of anger, he and Ratzi are determined to track down a vicious, psychopathic terrorist who's escaped from death row. Who helped him escape, and why? What determines his choice of victims? The answers lead LeBrock back into the world of politics, and help him reconcile the death of his father. I recommend these graphic novels most for their momentum. It's an intense ride; the mysteries and conspiracies drive the story forward at a rapid, energetic pace. There's tension and complexity and you want to know what happens next. Talbot plans to write more - the next book should be titled Grandville Bête Noire (Black Beast). The Grandville series is published by Dark Horse Books, so you should be able to find it through most large libraries or bookstores. Check it out! The Snowy cameo had me laughing out loud - poor Tintin's dog as a babbling morphine addict recounting his old adventures. So cruelly funny. Sorry, but I was just watching Pulp Fiction DVD extras literally seconds before logging onto Flayrah, so you get a bizarre apologia for QT. The director (and many film critics) have pointed out that Tarantino's movies are a lot less violent than most people remember; like another "violent" director who influenced him, Sergio Leone, lots of tension build-up before quick, mostly off-screen, in-the-mind's-eye violence. The Kill Bill movies even mostly follow this formula for violence. Grandville actually sounds more "Tarantino-esque" in its allusive qualities. An interesting movie "quote" in Pulp Fiction for furry fans: some of Uma Thurman's dance moves were inspired by the character of Duchess's dance in The Aristocats. I think the books are absolutely gorgeous, like all of Bryan Talbot's work. I'm not as happy with the plotting; I don't mind the violence, but LeBrock is a bit too invulnerable and the bad guys fold too easily under pressure. Still, I highly recommend both.